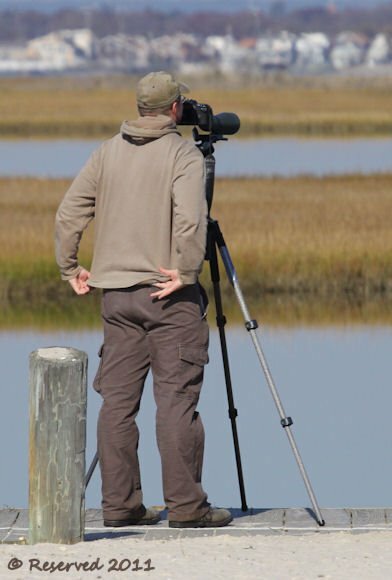 Rather, it’s that time again for Swarovski Optik North America’s annual digiscoping contest. If you’ve got mad bird-scoping skillz, now’s your chance to prove it. Entries are accepted until September 30, 2014 in four categories: Behavior and Action, Portraits, Mammals, and Videos. You can submit still photos or videos. For the first time, a prize will be awarded for shots taken with a smartphone. (Digital cameras are cool, too.) All images must be shot through scopes or binoculars. The “Digiscoper of the Year 2014” will be awarded a whole mess of Swarovski gear, and three other winners will get Swarovkski EL 32 bins. Not a scoper or shutterbug? No problem—you can play along at home. “Like” the ones you like most at the contest’s Facebook page—new images and videos will go up every month through October. Fan favorites will get Swarovski swag. 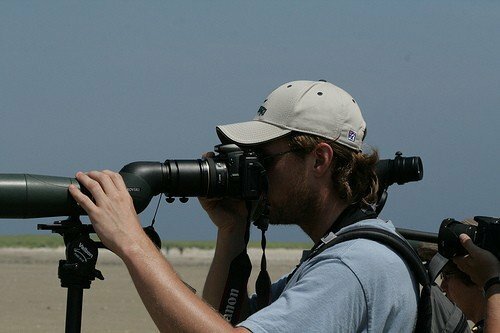 Image of Corey scoping, above, from Birdfreak.com; Digiscoping Corey below by Redgannet. This is altogether too much me! There is no such thing, fearless leader. No such thing! dramatic than either birding or fishing, but still not exactly The Game of Thrones. 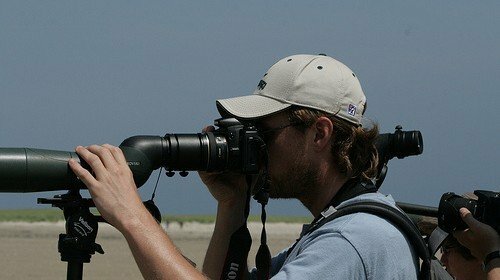 James Currie has a fast-paced, entertaining and eminently watchable birding show, but even it is on channels not easy to find. And it’s the only one (that I know of). So why are these other non-team sport activities able to support and keep a moderate TV audience while mentioning the same for birding (which you did above) generates a laugh (which you did above). Here are a few reasons and possible solutions as I see them. 1. Birders do not spend money. All you need is a pair of binoculars and a book. Some of us (less than 20%?) buy a scope. We all have cameras, but would buy those anyway. Trips? Yes, but there are so many places and so many tours that what individual tour leader would lay down the bucks for a TV show, when his money might just induce a viewer to use a competitor? Fishermen, hunters, golfers, spend money and attract sponsors to TV shows. You just gotta have that new lure, or that kayak to get into the flats, or a new club, or the automatic decapitating turkey arrow (yes there is such a thing). 2. Birders do not seem to want to see their birds on a screen, but in real life. Good for them. It’s no wonder that the ABA doesn’t offer a list category for birds seen on TV. No one is interested. This will change as the new generation of device-addicted kids grows up not able to tell the difference between virtual and real reality. and even if he (and the cameraman) get drop-dead gorgeous looks. Somehow it just isn’t the same as a big flopping fish, a glassy-eyed dead deer or a headless turkey. Is it the close-up contact with the quarry? Maybe a banding show would work. Is it the fact that something has died, or is at the total mercy of the host? I suspect that the answer may lie in there someplace. The solution to this, for a non-destructive activity like birding, could be in raising the excitement and “hype” level of the bird until it is finally found. At this James Currie is the master. It can work. identify with him/her and you lose interest. And so often, it’s “seen that, what’s next.” If the TV guy isn’t rejoicing over his bird, why should the audience? birds on the screen just isn’t exciting. 6. But it can be. And it should be. Seeing a ball go into a hole isn’t exciting either. What is needed is the anticipation. The people must talk about individual species before seeing them. Show pictures. Point out obscure field marks and make sure the audience sees them. That adds a sense of belonging to and identifying with the group on the screen. Get the bird doing something unique. Nest building, singing, showing body parts not usually seen (insides of mouths, for example), struggling with a difficult caterpillar. Stock footage or photos might help. The old adage of advertising holds here. Tell them what they are going to see, show it to them, and tell them what they just saw. As in any murder/cop show if people are in anticipation as to what they are going to see, they will keep watching. tips, websites for local Audubon chapters, etc. I am not aware of any shows or Internet entertainment venues that offer such things. If you can get Frank and Carol outside with their binoculars, and if they have a fun day, they will be back to watch next week. there has to be a story with a climax and a resolution. It can be show-long, like the deer-hunting shows do it, or several sequentially for a few minutes, like the fishing shows do it. That’s where the hard work comes in. There has to be likable, and admirable people that the audience wants to identify with. The people have to be shown having a good time, being successful and maybe ending the day with a microbrew. It is important to portray birding to the rest of the world as something they might actually want to try. Some gorgeous scenery wouldn’t hurt. a first year Rose-breasted Grosbeak. This has happened to all of us at one time or another, and viewers will relate to it. Yes, a little acting is needed, but, hey, this is TV, and someone in your community wants to be a star. So after all that optimism, here’s the kicker. Getting a birding show on TV is next to impossible. Although there are hundreds of cable and satellite stations hungry for content, there are thousands of orgnizations trying to get on the air. Did you know that Ken Burns has to pay PBS to air his shows (or at least he did in the beginning). Did you know that other shows on the station you want might prevail upon the owners to keep you off of their turf. And it ain’t cheap. But the Internet is. Love that Internet. Definitely the way to go. Where Are You Birding This Third Weekend of June 2014?